It’s been a busy few months here and the bags under my eyes have gone Pantone 421. I’ve had one project after another with barely a pause for thought and whilst I’m not grumbling, it is good to come up for air every now and again to refuel. I like the idea of Autumn but the reality is that I have to fight quite hard not to feel a bit flat. I don’t welcome winter and I am that annoying person who, on the 21st December reminds people that the days will be getting longer now. Conversely, I’m also the daylight doom merchant on June 21st. I’m nothing if not balanced. So what have I been up to. Well, I have been doing a bit of housekeeping on my Etsy shop, making sure all the text and photos are up to date ready for Christmas. It’s easy to get a bit slapdash when life gets busy and I don’t want my customers to think I’m tardy. Speaking of Christmas, I’ve just had 100 cardboard tubes delivered and it is really adding an air of stationery cupboard to my living room. I’ve also ordered some festive red ribbon for for my gift tags. Ho ho ho. Last year Christmas caught me by surprise, this year…I’m ready. 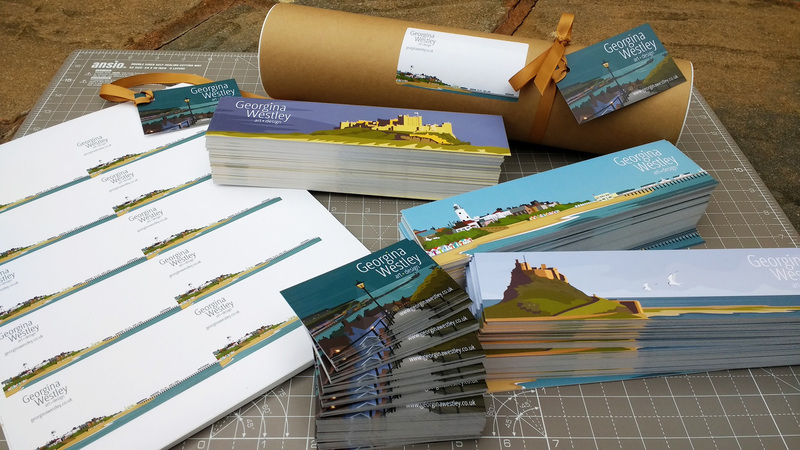 I am hoping see my artwork in gift shops around the UK soon, more about that another time but watch this space. I delivered my Pecha Kucha presentation and I am working on the poster for the next event in January. Richard Slade who runs the event has animated my RAF Tempsford print and it looks great, I’ll post that in the next few days. 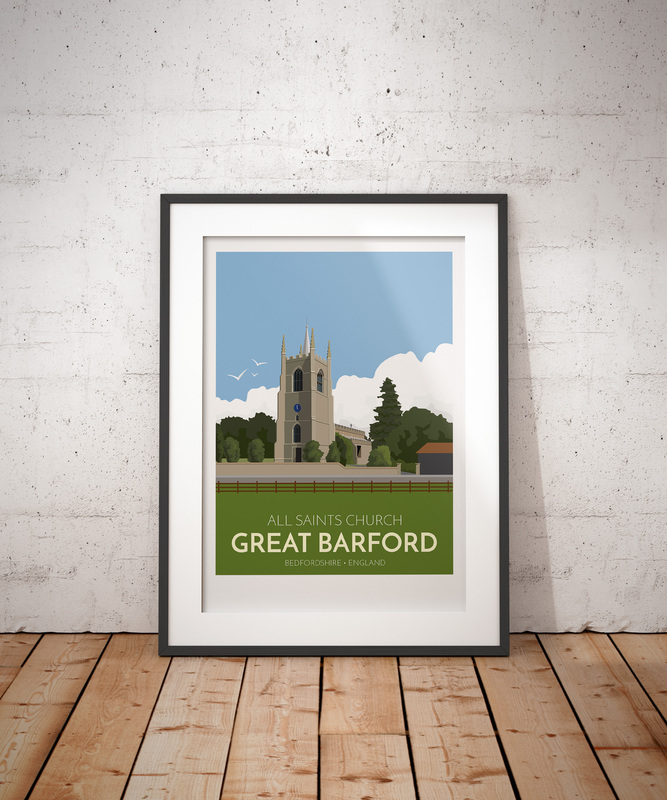 My latest artwork is of All Saints Church in Great Barford, Bedfordshire – it’s just down the road from me and was created for a friend’s wedding anniversary. 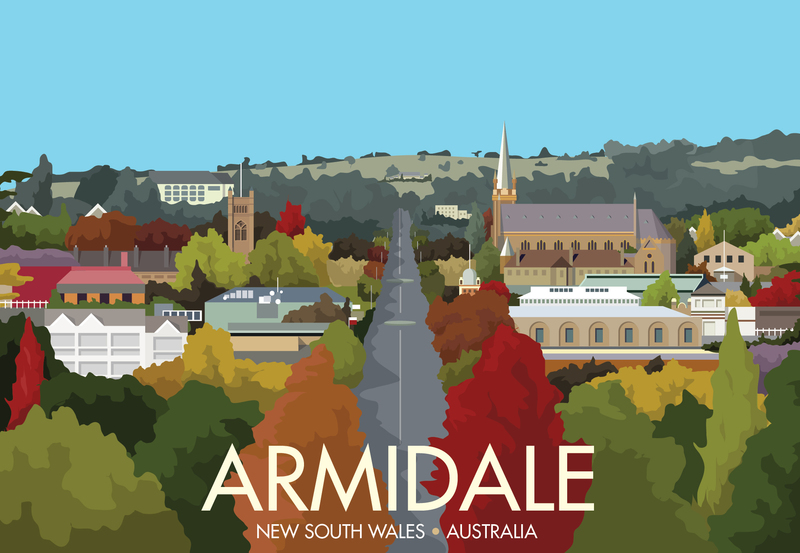 I’ve had lovely feedback on my Armidale print and I’m pleased to say that it will be hanging in the main visitor centre in the city very soon. I’m really chuffed about that. 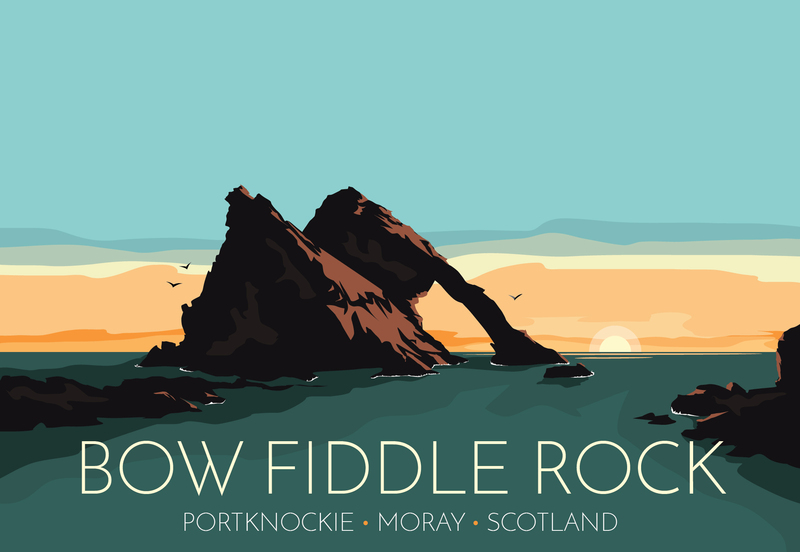 I also loved creating the Bow Fiddle Rock print and am looking for some more similar places as I love doing seascapes. They don’t have to be rocks that look like musical instruments (although team points to anyone who can find another), but something a bit interesting would be good. I might do Durdle Door? In fact a customer did suggest I do some Dorset ones a while back so this would tie in nicely. I’ll add it to the list. Yes, the list. It’s getting very long. I have lovely customers who suggest great ideas and now I have a very, very long list of places to research. I can’t do every suggestion. As I’ve said before I have to weigh up how popular they might be as they do take quite a few woman hours to create. But I do love it when my prints strike a chord with people and remind them of happy times. Emley Moor Mast and Glastonbury are my best sellers to date and both were suggested by other other people. So what next? Well the list is varied and exciting and I reckon 2017 is going to be a busy year. I will be continuing to work hard and create some more prints before Christmas and I’ve got some lovely ones in the pipeline. I am currently working on St Ives, Cornwall which was suggested by…me. It’s one of my happy places and it’s going to be very purply.